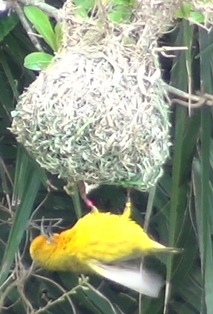 While ringing at a Cape Weaver colony at Langvlei in Cape Town on 21 October 2011, adult male CV53677 was recaptured. This bird had been ringed as a chick in one of the nests on the island at Langvlei on 19/11/2009 in a project on natal dispersal (see also results). While Cape Weaver chicks often seem to disperse from their natal colonies, this male came back 23 months after being ringed. The male was colour ringed (on 21 Oct)and this morning (24 Oct) observations showed that the male was displaying and nest-building in a palm tree on the island - see colony details and video here. Four other chicks ringed at Langvlei have been recaptured at other wetlands nearby. One of these birds was recaptured several times, see here.